Challah, a traditional braided bread made of egg-and-oil-enriched dough, is prepared much the same way in Jewish communities around the globe. But that hasn’t stopped modern cooks from putting a personal spin on it. Take Leah Koenig’s delicious pumpkin apple butter challah, or Deb Perelman’s fig and sea salt variation. Five years ago, on a whim, I added garam masala, an Indian spice mix, to my favorite challah recipe. 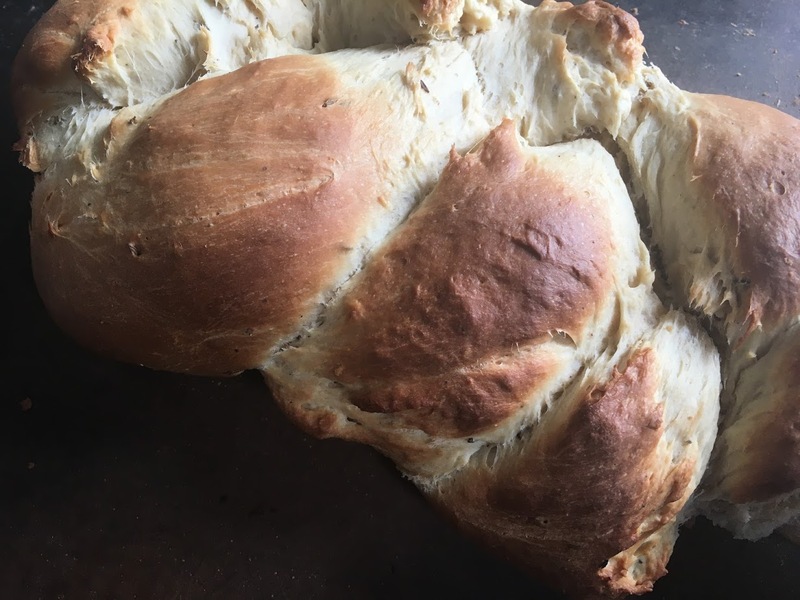 I had forgotten all about it, until a friend mentioned recently that she had come across a challah recipe with Indian flavors on the blog Foodwanderings. 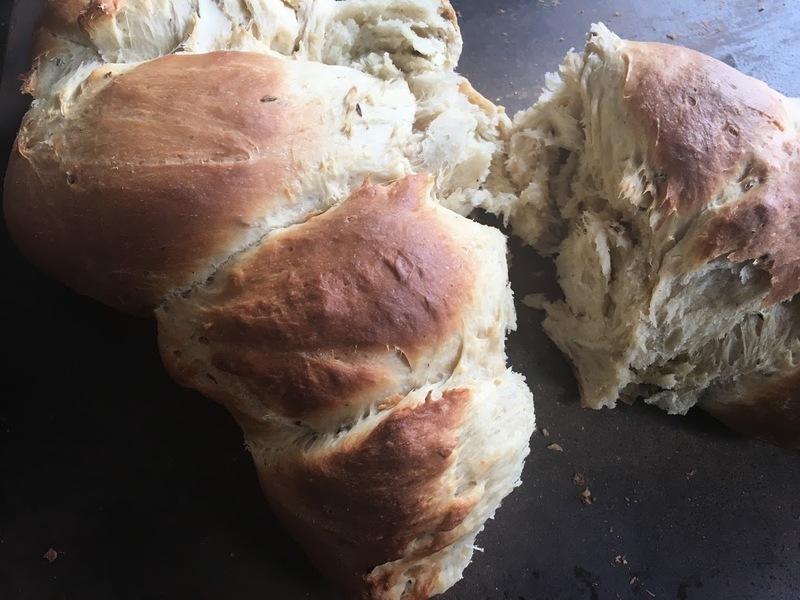 In a nod to her Indian Jewish roots, the blog’s author, Shulie Madnick, infused challah dough with mustard seeds, turmeric, saffron, and curry leaves. Jews have lived in India for over two thousand years, mainly in the cities of Cochin, Chennai, and Mumbai. With the exception of challah, which is prepared the traditional way, Indian Jewish cuisine incorporates local ingredients and flavors, like coconut, cardamom, and cloves. I decided to go back to the drawing board and improve my “masala challah” recipe. Rather than use store bought garam masala, as I did last time, I created my own spice mix. Ground cinnamon, cloves, and cardamom add warmth, while whole cumin and fennel seeds provide little bursts of spice. The result is delicious, and addictive! Challah is traditionally glazed with egg wash, but I think omitting this step makes for a drier, crisper crust that complements the bread’s rich, fluffy interior. If you prefer egg wash, mix together an egg with 1 tablespoon of water. Just before the challah is ready to go into the oven, brush the mixture over the top and sides of the loaf using a pastry brush. Sprinkle with additional cumin and fennel seeds. To bring out the flavor of the cumin and fennel seeds, I suggest lightly toasting them at 375 degrees F for a few minutes, until fragrant. I find olive oil improves the flavor of challah, but feel free to use whatever vegetable oil you have on hand. Prepare dough: In a large bowl, stir together 2 cups of the flour, yeast, sugar, salt, and spices. Add eggs, oil, and water. Mix until smooth. Add remaining 2 cups of flour, stirring until a dough forms. On a lightly floured surface or directly in the bowl, knead until dough is smooth and elastic, lightly dusting the dough with flour if it gets too sticky. As Evelyn Raab describes it in her cookbook, the dough is ready when you pinch it and it feels like the texture of your earlobe! Cover bowl with a kitchen towel or plastic wrap, and let rise until doubled in size, about 30-45 minutes. Transfer to a baking stone or parchment-lined baking sheet. Cover with a towel and let rise for 20 minutes. Bake: While challah is rising, place a rack in the middle of the oven and preheat to 375 degrees F. Bake for 30-35 minutes, until crust is a deep golden brown. Let cool for at least 5 minutes before eating (you can transfer to a cooling rack, but I’ve found it works out fine to let the bread cool directly on the baking stone or tray.) As the challah cools, the inside of the bread will continue to cook. Once fully cooled, store any remaining challah in a ziploc bag or airtight container at room temperature for several days. Recipe adapted from The Clueless Baker, by Evelyn Raab.